Leigh Electrical offer a wide range of commercial lighting solutions to businesses in Southend-on-Sea and Essex. All varieties of commercial lighting are covered and you can ensured of a swift, cost effective and professional service. We have installed lighting for hundreds of commercial enterprises across Essex and London over the past 50 years so our customers can be assured they have contracted with experienced professionals who simply want to get the job done. Whatever you commercial lighting requirements, please contact us to arrange a no obligation, completely free site survey on 01702 873350. Leigh Electrical hold full NICEIC accreditation, which is often regarded as the highest level of commercial electrical accreditation in the UK. We are also members of Trust Mark, the Government scheme to enable business owners to find trustworthy and reliable contractors. Our electricians operate 7 days a week including nights and evenings. This is very useful for commercial customers as it allows lighting to be installed and upgraded without disturbing their business activities. Installation of LED spotlights have become a common request from customers seeking to save on commercial electricity bills and implement a clutter free, more refined look to their business premises. Please click on the following links to see examples of commercial spotlight installations performed by Leigh Electrical in Brentwood and Southend-on-Sea. For more information regarding commercial spotlight installations please call 01702 873350. Leigh Electrical have significant experience in installing decorative and feature lighting into business premises. Installations such as these require a great deal of care and attention to detail. Please click on the following links to view previous installations of decorative and feature lighting carried out by Leigh Electrical in Basildon and Southend-on-Sea. A popular choice for offices and other businesses where excellent light coverage and low electricity bills are paramount concerns. LED strip lights offer excellent coverage on both of these fronts, hence their continuing popularity with the business community. 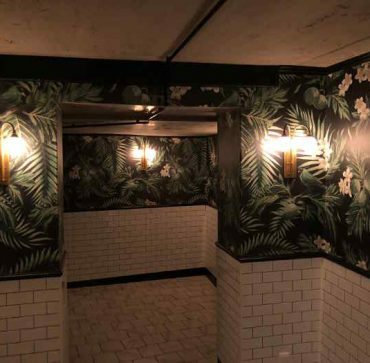 We have completed numerous strip lighting installations, to see some examples of these installations please select one of the following links for Southend-on-Sea and another job recently completed in Billericay, Essex. 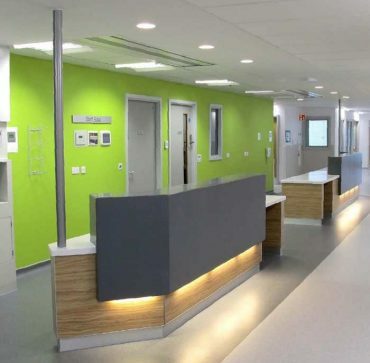 To learn more about strip lighting installations in Southend, Essex and London and to arrange a free site survey, call our office today on 01702 873350. External flood lighting is a very popular choice for business owners for security and light coverage in external environments. Advances in LED technology mean that flood lights can now be energy efficient as well as providing superb light coverage. 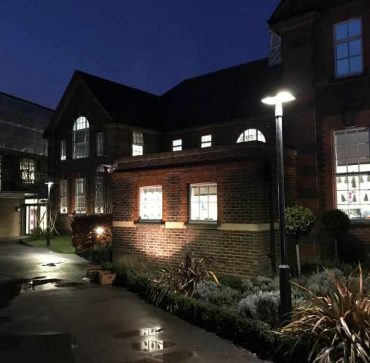 Please follow this link to view a recent installation of commercial flood lighting completed by Leigh Electrical in Southend-on-Sea. Leigh Electrical have carried out dozens of lighting installations at offices throughout Southend and Basildon, Essex. We can complete these works over weekends or overnight, to help avoid any downtime to your offices business activities. With over 50 years experience in completing large scale factory lighting installations, you can be rest assured that your installation will be completed on time and on budget. Please select one of the following links to see examples of factory lighting installations recently completed in Southend-on-Sea. Leigh Electrical are very aware of the unique challenges that factory lighting installations pose and have the experience and qualifications to deal with them. To speak to our team and arrange a time for us to come and conduct a site survey for your factory lighting installation, please call 01702 873350. The commercial lighting installation service provided by Leigh Electrical for shops in Essex & London has been praised numerous times on Trust a Trader. Our ability and willingness to work 7 days a week including evenings and overnight, allows our customers to have lighting installed and upgraded outside of opening hours, meaning a minimum of disruption to their customers. Leigh Electrical have completed dozens of complex and visually stunning lighting installations for clients in the catering industry. Here are some recent examples of this type of installation we have completed in Southend-on-Sea and Basildon, Essex. 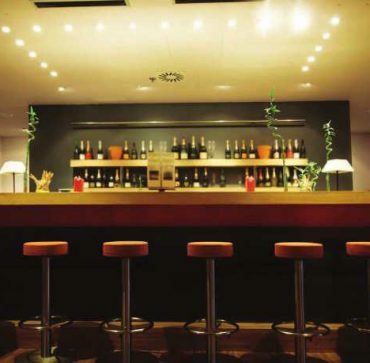 For more information regarding lighting installations in restaurants & bars, please call us directly on 01702 873350. Leigh Electrical also offer a full compliment of additional commercial electrical services alongside our commercial lighting service.